Blurb: Celebrating one of the pioneering artists of the proto-industrial/post-punk sound, this collection proves the depth of Fad Gadget’s impact on modern music. Fad Gadget – the stage name of Frank Tovey, now well regarded as one of the pioneering artists of the early post-punk electronic sound; to say that his influence in the world of industrial, synthpop, and avant-garde electronic music is profound would be an understatement. Combining synthesizers with found sounds, power tools, and other experimental techniques, Tovey’s music was a sardonic and bleak reflection of life in an increasingly industrialized and materialistic age, set to an acerbic deadpan voice that was as biting as his lyrics. He was the first artist to sign to Daniel Miller’s Mute Records in 1979, and continued to push creative boundaries well until his death in 2002. Now, DJ Seraphim – a.k.a. Chris Halstead – and Cleopatra Records pay tribute to the lasting power of Fad Gadget; originally released as a digital-only album in early 2017, and mastered by God Module’s Jasyn Bangert, we now have this compilation, Under What Flag. In this writer’s opinion, tribute compilations are a difficult animal to tackle; its very existence is usually a testament to the longevity and profundity of the subject, while also running the risk of unevenness due to the divergent sounds on display. Production, creativity, execution all tend to vary as it does on this collection, which all goes to show the different ways in which Fad Gadget inspired these bands and the modern electro/industrial scene. Bioassay’s opening rendition of “Collapsing New People” sets the tone with darkly danceable version that is extremely faithful to the original, almost to a fault; indeed, it’s a good cover and almost reintroduces the listener to Fad Gadget quite well, but it hardly stands out on its own. The same can be said of “Back to Nature” as Cortex Defect’s take on the song his all the right atmospheric notes of rawness and primitive electronic production that does little to deviate from the original. In contrast, the versions by NOIR and Leæther Strip are slightly more interesting, with the latter’s simple and straightforward cadence proving as catchy as any of Claus Larsen’s other works, while NOIR performs the song in a slower, moodier version that does the song quite a bit of justice. On the other hand, while Blicky and Missing Witness are faithful in their interpretations of “Ricky’s Hand” and “The Box,” respectively, they prove among the album’s least notable entries. However, there are some moments of absolutely inspired homage as on Canter’s version of “The Box” with its slow, cold, desolate vocal and synth treatments creating a blissfully tense and distorted ambient mélange that, dare I say, might be better than Fad Gadget’s original. Similarly, the whimsical waltz of “Saturday Night Special” is taken to new heights of unhinged depravity and boisterousness as Maleagant slows the tempo and places a heavier emphasis on the song’s disconcerting piano modes, the vocals being a particularly unsettling highlight. As well, Charlatan revels in the quirky, jazzy lounge vibe of “Fireside Favourite,” the distorted and reverb drenched guitar mirroring the caustic rawness that defined much of Fad Gadget’s sound, while Cylab’s version of “Swallow It” is nicely gritty and percussive, its rubbery bass synths more reminiscent of that band’s own music. And then there is George Sarah’s marvelous interpretation of “Arch of the Aorta,” transmuting the song into a gorgeous ambient instrumental, its lush textures reveling in the song’s atmosphere without the superfluidity of beats and vocals. Though he is often overlooked in the annals of industrial and early electronic pop music, what Under What Flag proves is the depth of Frank Tovey’s impact on modern music, helping to forge not just a sound but a way of making music – an unorthodox and adventurous spirit that few others of even his generation can lay claim to. 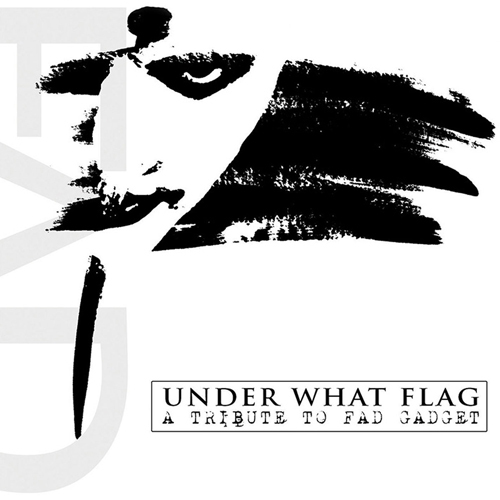 Even on those covers that failed to impress this writer can it be said that Fad Gadget’s mark has been indelibly felt, and Under What Flag may be an essential collection for Fad Gadget fans in particular, but also those with an ear for proto-industrial/post-punk and early electronic music curious to learn about one of its progenitors.